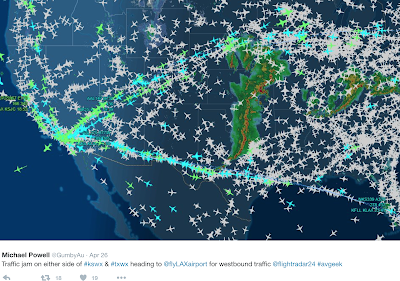 Tuesday evening, 26th, the night when more tornadoes were forecast than actually occurred, was an air traffic controller's nightmare. 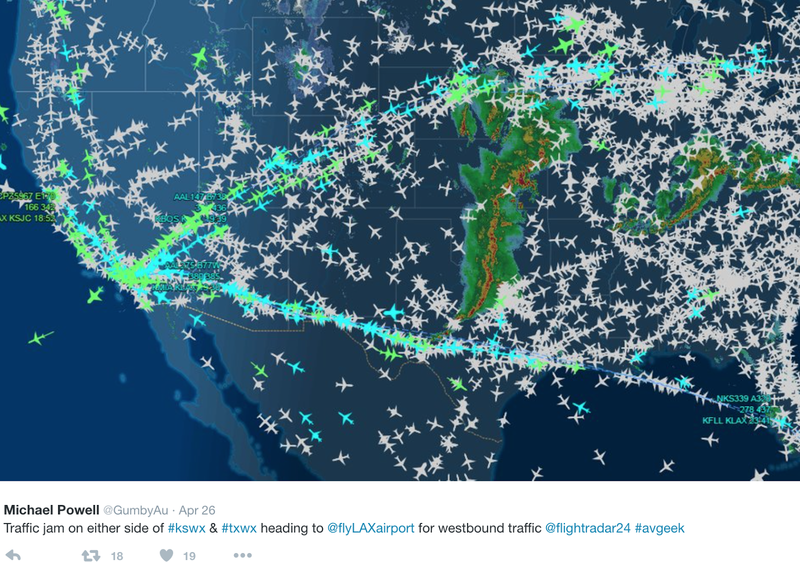 This, via Twitter, is a snapshot of the flights headed to and out of Los Angeles International Airport. 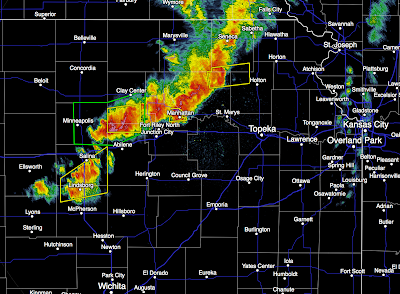 All of them are having to go around the complex of thunderstorms in the Great Plains. The few flights in the middle are going to other airports in the region. There is a tremendous supercell south of Chickasha, Oklahoma, that has been trying to generate a large tornado with only partial success. It has just crossed U.S. 81. The storm is moving ENE. 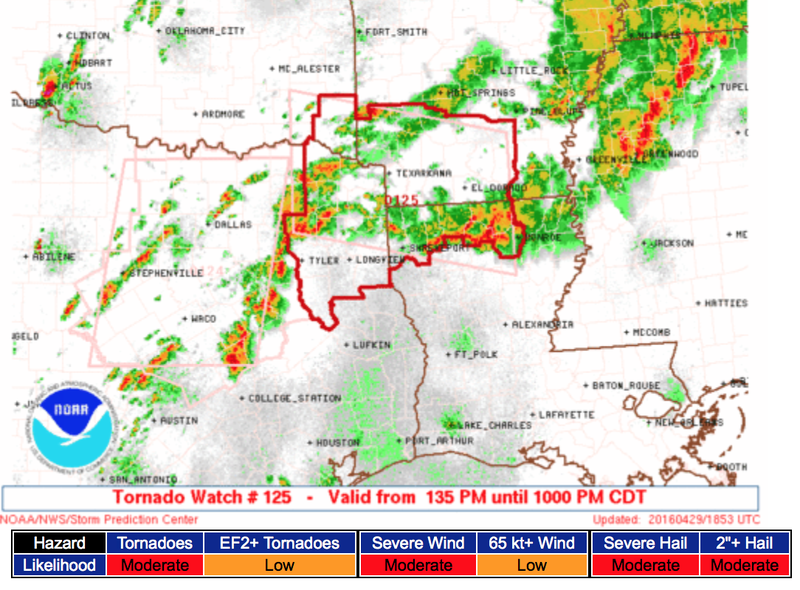 Tornado watch continues for the region. 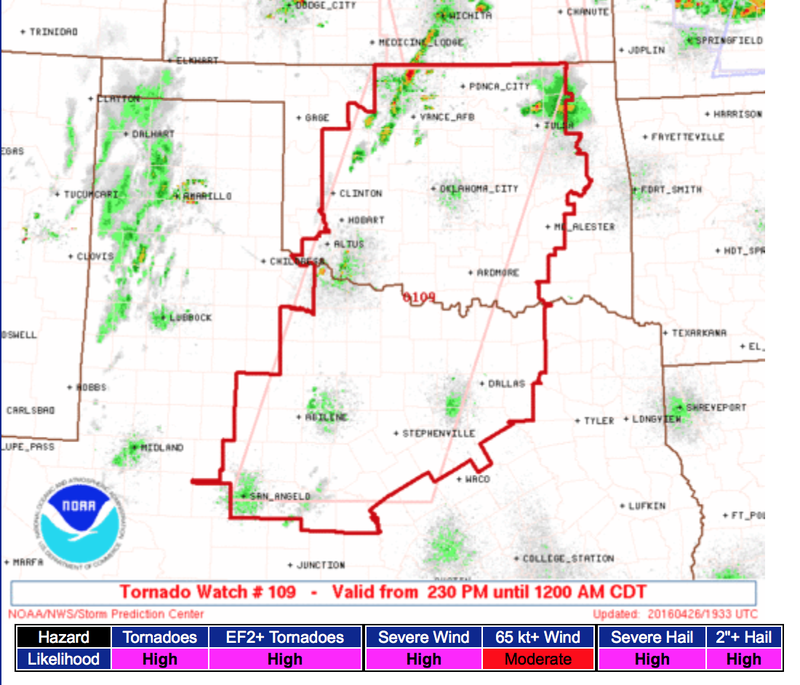 A third tornado watch for Oklahoma and the area around Wichita Falls, Texas. Also, until 10pm. This watch is in effect until 10pm. Tornado watch now in effect until 10pm. Here is the updated tornado risk. It has been moved south and west. 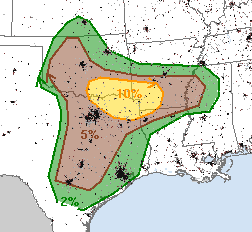 The DFW Metroplex is now in the 10% area. Please keep in mind that 5% is the significant threshold. This could be another afternoon and evening of very large hail. Here 15% is significant and the hatching is areas where the hailstones could be larger than 2 inches. I'll update a time or two this afternoon and evening. The brown, 5%, is the significant threshold. If you live in these areas, please keep up on the weather today and tonight. Others Are Realizing "The Single Most Important Question"! What is the ideal earth temperature for the human race? Without an answer to that question, all of the climate debate is utterly irrelevant. As readers know, I have posed this questions, numerous times, to various climate scientists. I even sent it to a climate publication. No one wants to answer. Unless we know what the idea temperature is, we wouldn't know -- assuming it were possible -- how we calibrate any adjustable effect by humans on climate. Imagine something that is entirely possible—that a single such technological breakthrough enables us to control the world’s average temperatures. Could we then agree on what the ideal temperature should be? Is the current global average temperature the ideal one? Many would take that for granted, and climate alarmists appear to presuppose it, but the proposition is hardly self-evident. "Hardly self-evident" is putting it mildly. The excerpt comes from a superb article about the climate at the purple link which I highly recommend. This is the script I had prepared for the (cancelled due to weather) ceremony to commemorate the 25th anniversary of the Wichita-Andover Tornado last night. I thought some who were planning to attend might want to read it. The (S) is where the slides changed. When I kissed my wife and children goodbye and left the house for work 25 years ago today, I had a terrible pain in the pit of my stomach. 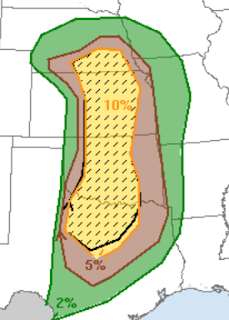 After reviewing the data, I knew there were going to be violent tornadoes in southern Kansas. My hope was they would occur in unpopulated rural areas. But, that was not to be. 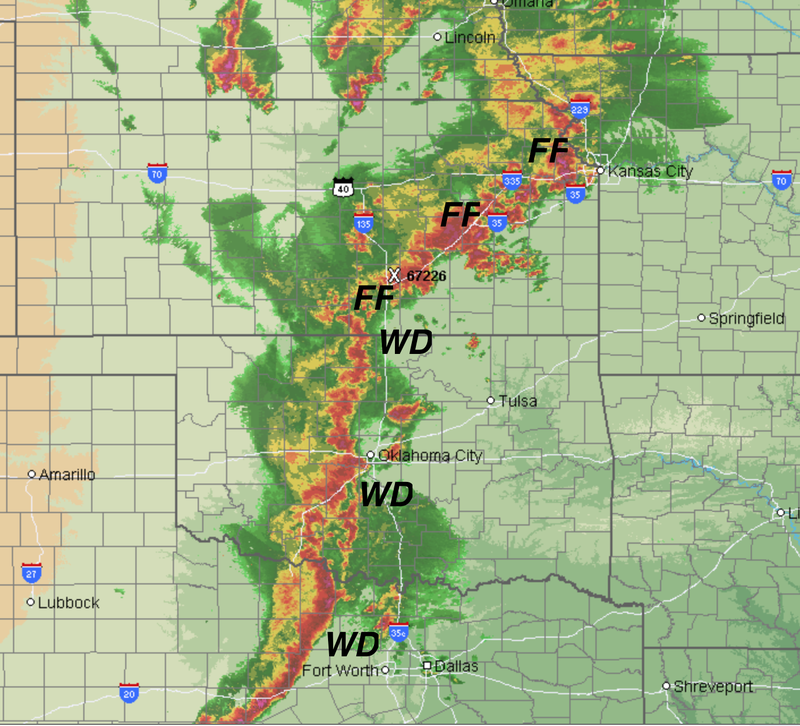 So, my next hope was that the early tornado forecasts – that local meteorologists started broadcasting three days before – and the warnings to be issued later in the day ahead of the tornadoes would save lives. Considering the state of the art of tornado forecasting in 1991, the forecasts that Friday were amazingly good. 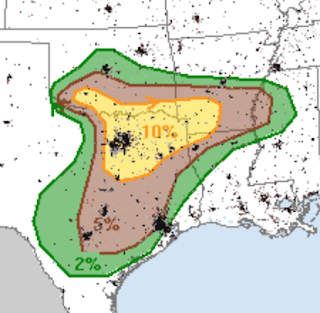 The morning tornado outlook, seen on the “Today” show’s and “Good Morning America’s” local cut-ins, predicted a rarely-forecast “high” risk of tornadoes. (S) The tornado watch issued at 12:10pm was only the second “particularly dangerous situation” tornado watch ever issued by the National Severe Storms Forecast Center. 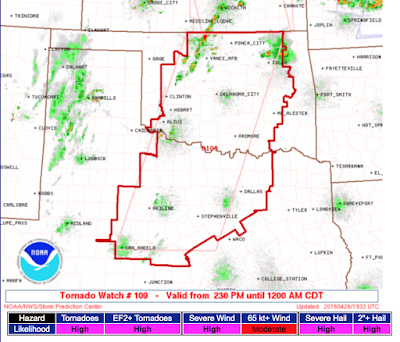 That watch, broadcast over and over on local radio and television throughout the afternoon, gave more than five hours of advanced notice to the Wichita Metro area that we had an extraordinarily high threat of tornadoes. 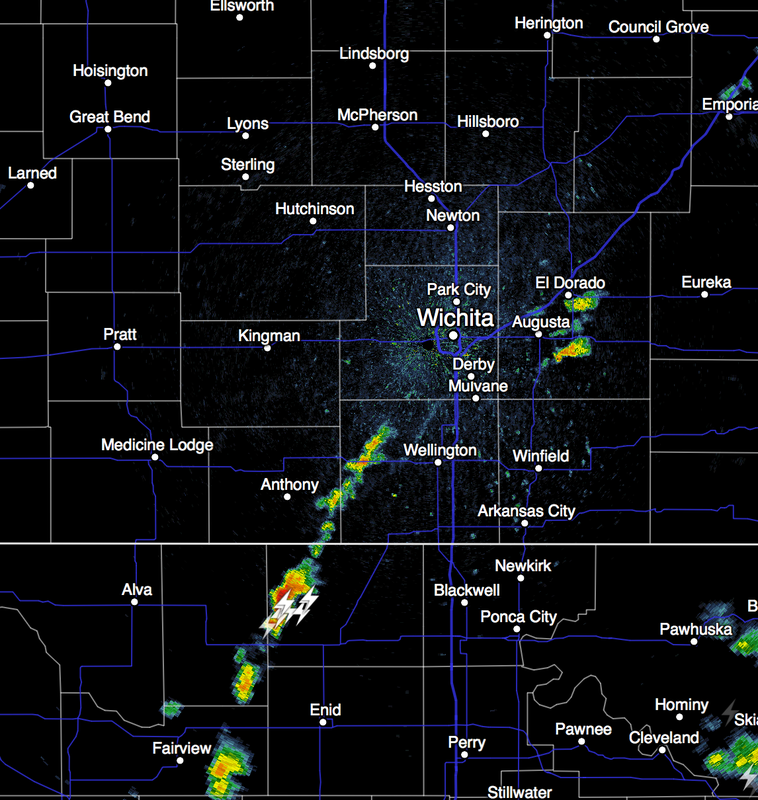 About 4:30, the first thunderstorms began developing southwest of Wichita. The first tornado was a brief storm near Attica. The 5:30 network news led with stories about the resignation of Gen. Charles Thomas and his contention that defense cuts threatened the security of the United States. Unfortunately, that would no longer be the lead story by the time the newscast ended. 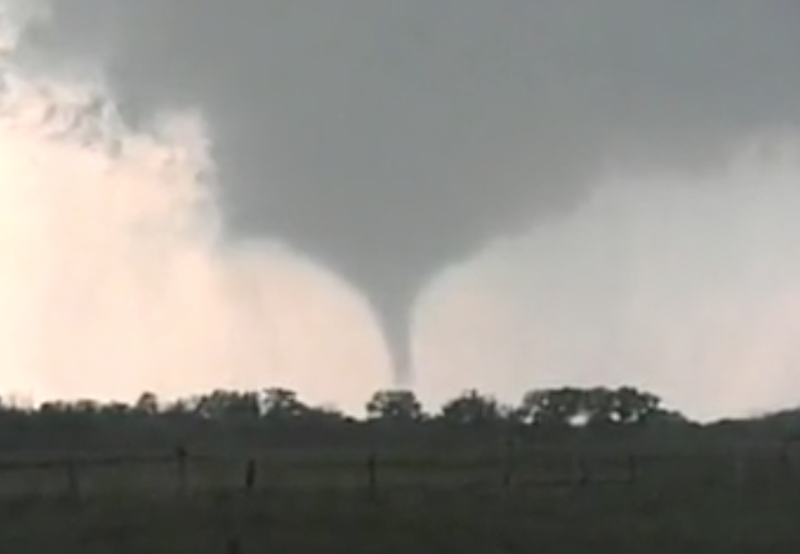 Wichita’s Rynotek Media and I put together the brief video I will show momentarily of the tornado and the tornado coverage from the time it was in the area of Conway Springs. The first cut-in was during the 5:30 NBC Nightly News. The first tornado in the Wichita metro area was actually in Goddard where several buildings, including a boat dealer, were destroyed. The tornado that had been near Attica had lifted. But, that same supercell thunderstorm was about to produce the Andover tornado. 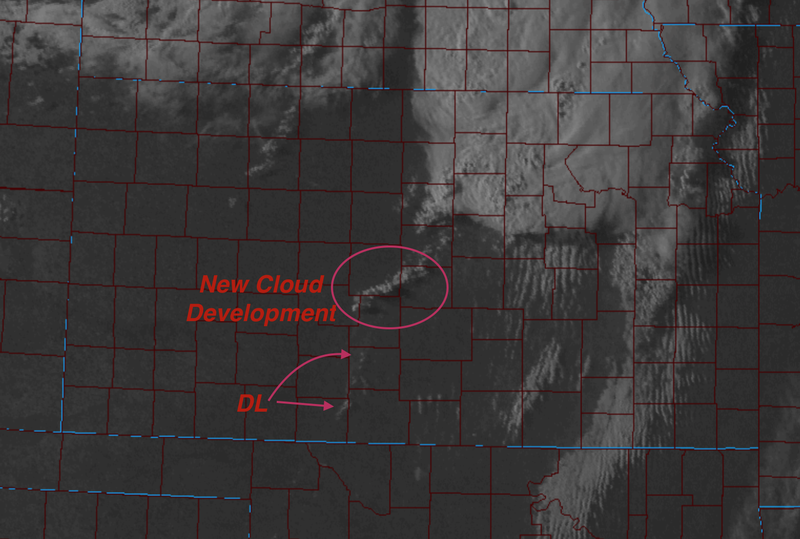 Now that we have set the scene, let’s review this brief video and a sample of the warning messages and corresponding appearance of the tornado 25 years ago at this time. The warning you just saw for Andover was 19 minutes before the tornado crossed Andover Road. I’m certain Jim O’Donnell and Merril Teller also did great jobs that evening, but, as you can imagine, I was far too busy to check out the competition. We've already seen that Dan Dillion and John Wright did a terrific job on KFDI. Even by today’s standards, 19-minutes would be considered an excellent warning. 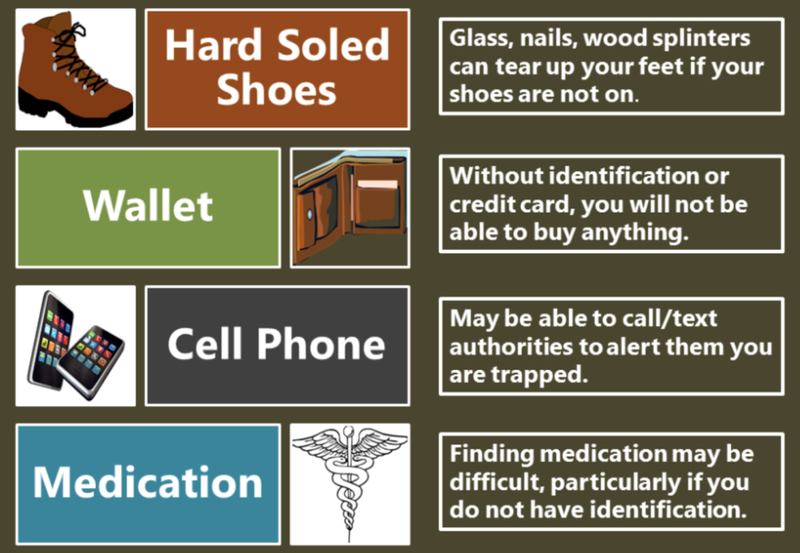 The U.S. Centers for Disease Control did its first-ever morbidity study on the Wichita-Andover tornado. You know what they learned? That, without the warnings, the tornado would have killed 94 people! The warning system saved 77 lives! 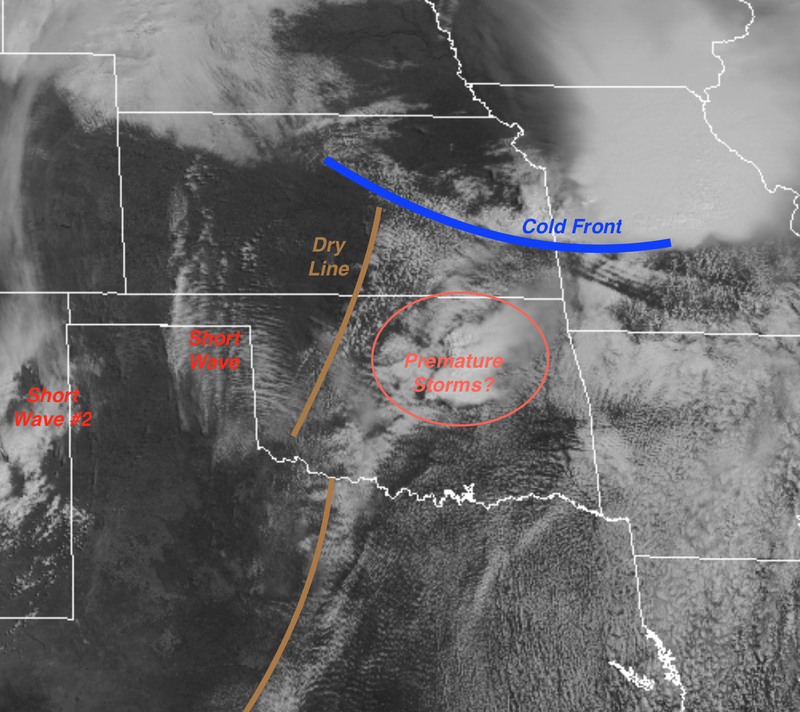 While people in south central Kansas were recovering from the shock of the disaster, weather scientists in Norman, Oklahoma, were reviewing the data from the first-ever violent tornadoes that appeared on the prototype Doppler radar installed earlier in the week. Since 1979, 12 years earlier, a Doppler radar network had been proposed for installation across the United States. What makes Doppler different from conventional regular radars is that it can measure the winds inside of a storm. 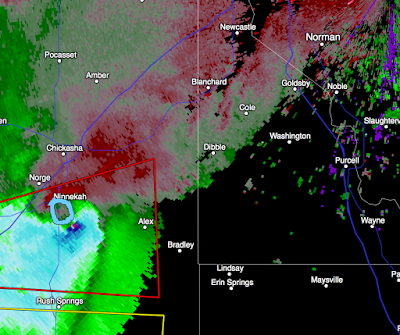 Tornadoes become much easier to see so warnings can be issued. Since the radar performed well, one would think quick implementation would follow. (S) Unfortunately, politics stood in the way. In July of 1991, Congressman Dan Glickman convened a congressional hearing in Wichita and told the NWS, “I want a Doppler radar!” for Wichita and for the nation. The network of Dopplers was installed beginning in 1992. (S) Since the Doppler radar network was installed, our nation has gained an average of ten precious minutes in tornado warning time. We are up to 14 minutes, which is plenty of time for people to get to shelter. And, now, the amazing statistic: Rate of deaths from tornadoes has been cut by 97% since the 1930’s, the last decade when there was no warning system of any kind!! 97%!! In any other field, this would merit a Nobel Prize. Meteorologists are the most dedicated people you will ever meet. Whether they work for AccuWeather, the National Weather Service or our local TV and radio stations, meteorologists put in countless extra hours to insure the safety of people of our region. As I stated earlier, we saved 77 lives on that day 25 years ago and have cut the U.S. tornado death rate by an incredible 97%. I believe the meteorologists, storm chasers and other members of the storm warning team in the audience this evening would appreciate a round of applause. Today, of course, Doppler radar is taken for granted. (S) And, in the last five years, those same radars have been upgraded with “dual-polarization” capabilities. That allows them to measure rainfall far more accurately and better detect hail and, yes, even tornadoes. But, weather science isn’t finished. A new weather satellite to be launched by NOAA this October promises one-minute pictures of tornado-producing thunderstorms and other critical data with an ultimate goal of even better weather forecasts and warnings. Many of you know that, AccuWeather Enterprise Solutions, the company for which I am Sr. Vice President, has a contract with the City of Andover to provide city-specific warnings. Butler County is one of the largest counties in the United States and a tornado can occur in one part of the county while it is literally sunny elsewhere. Given the trauma caused by the 1991 tornado we commemorate today, city officials want plenty of warning if there is a genuine threat but do not want the sirens to sound and a warning to go out unless Andover is genuinely threatened. 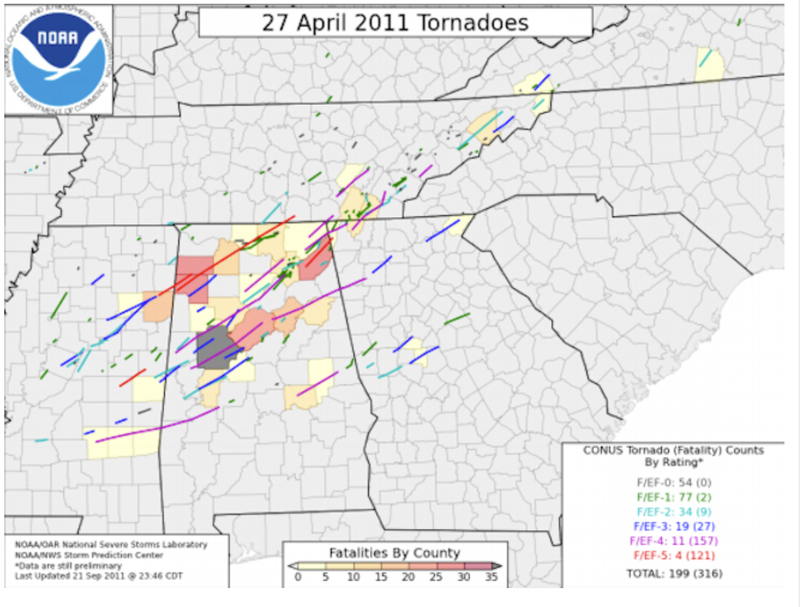 To give you an example, the night of April 14, 2012, Spirit Aerosystems, Beechcraft, and others were hard-hit by an EF-3 tornado. We provided 12 extra minutes of warning to the City of Andover. Fortunately, the tornado weakened considerably before it reached Andover and only scattered, very light damaged occurred here. And, now, a personal note. I have made the provision of warnings of extreme weather my life’s work. What our team did 25 years ago today is one of the proudest moments of my career. The next speaker, Chance Hayes of the National Weather Service – another extremely dedicated meteorologist our region is lucky to have, is going to complete the warning circle by talking about advances in tornado safety. 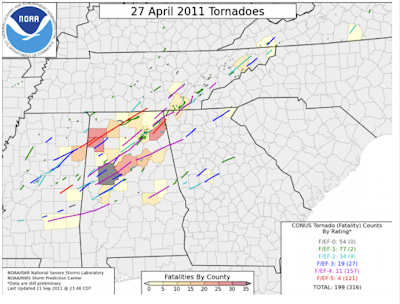 Five years ago today, one of the five worst tornado events in U.S. history occurred with a swarm of tornadoes primarily in the South. 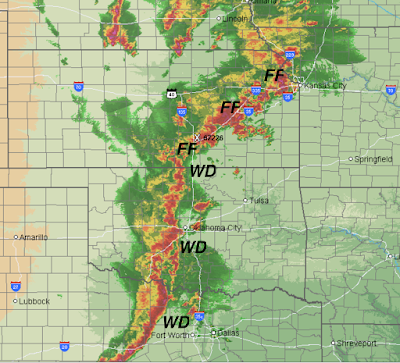 There was a round of tornadoes and damaging winds in the morning that knocked out power to hundreds of thousands which prevented people from getting the warnings during the even worse round of tornadoes in the afternoon and evening. James Spann, based in Birmingham, is one of the finest television meteorologists in the United States. It is difficult for people outside of the regions of the nation visited by tornadoes to understand the horror of these storms. Two hundred fifty-two died in Alabama alone. To help understand, I highly recommend this article. I have some things I have to do this morning. Please check back this afternoon. Much more to write about. 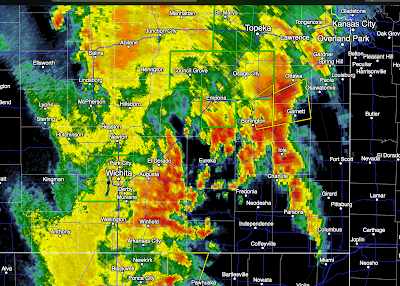 Radar from 9:25pm. 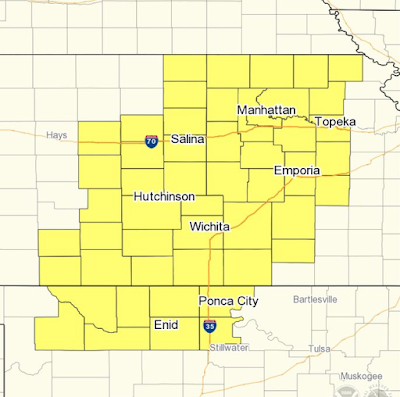 I continue to be concerned about flooding during the night from Wichita to KC along the counties containing I-35 and one county on either side. This is the final update of the night. WD = wind damage. 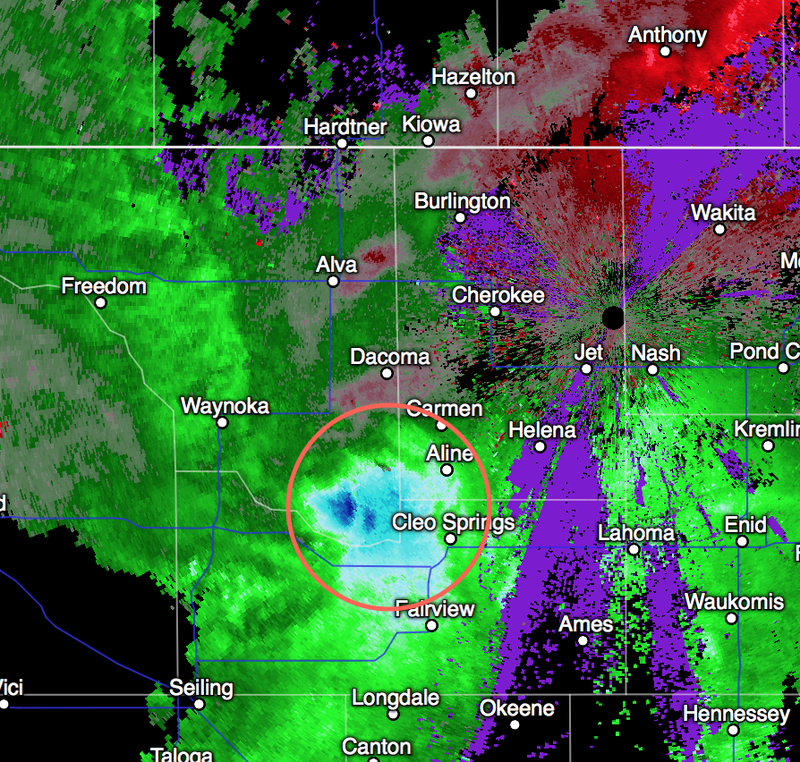 Within the last 20 minutes there were gusts of 70 mph around Chickasha, Oklahoma. 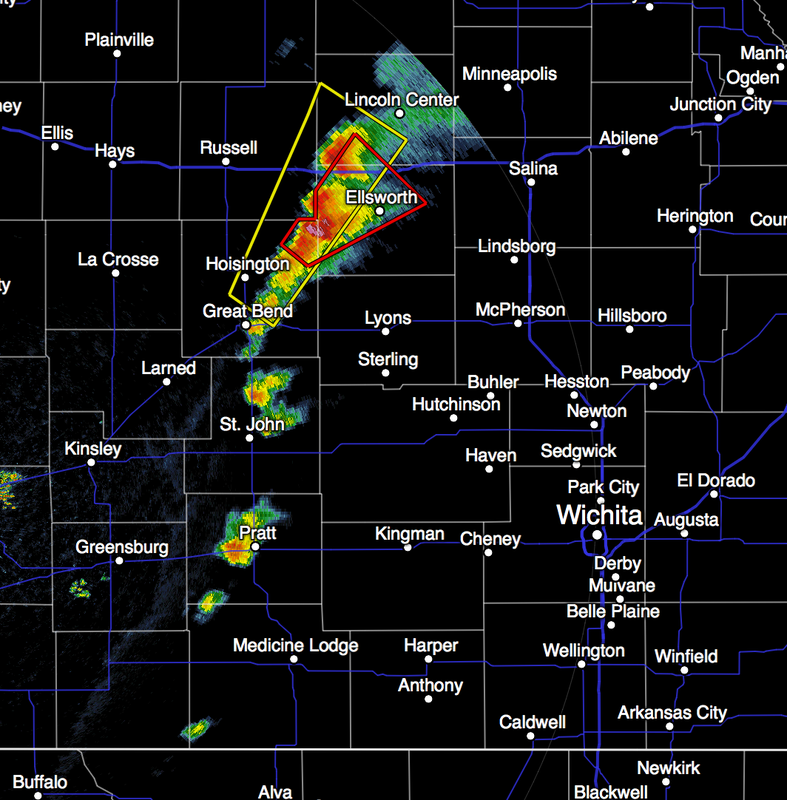 The isolated cells ahead of the line might cause tornadoes. There is also a chance of a brief tornado in the lines with damaging winds. In Kansas, the primary threat is flash flooding. Here is the radar at 7:30pm. 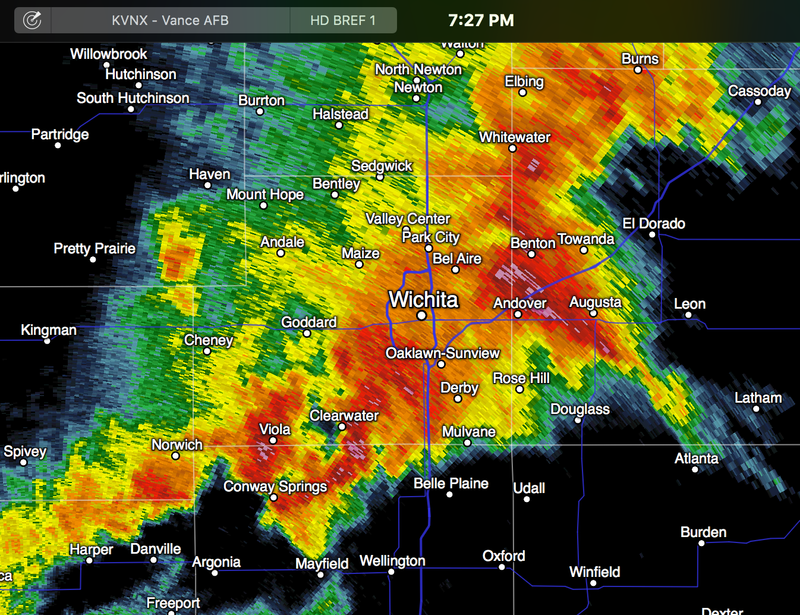 The storms are moving NNE bringing more heavy rain to the Wichita area. 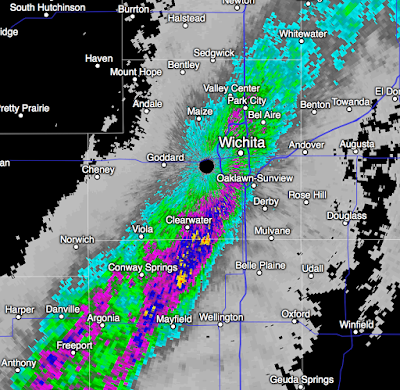 The dual polarization radar shows as much as five inches of rain have already fallen. The #1 cause of deaths in flash flooding is driving into flooded areas. Turn around, don't drown! 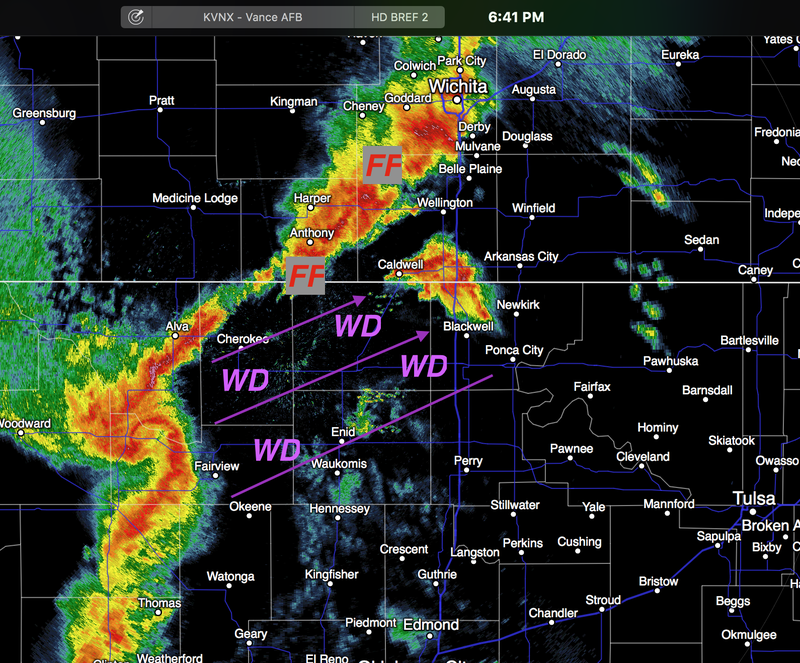 Wind damage (WD) ahead of a rapidly developing "blow echo" in northern Oklahoma that will move into southern Kansas. They sometimes produce brief tornadoes. FF = flash flood threat. 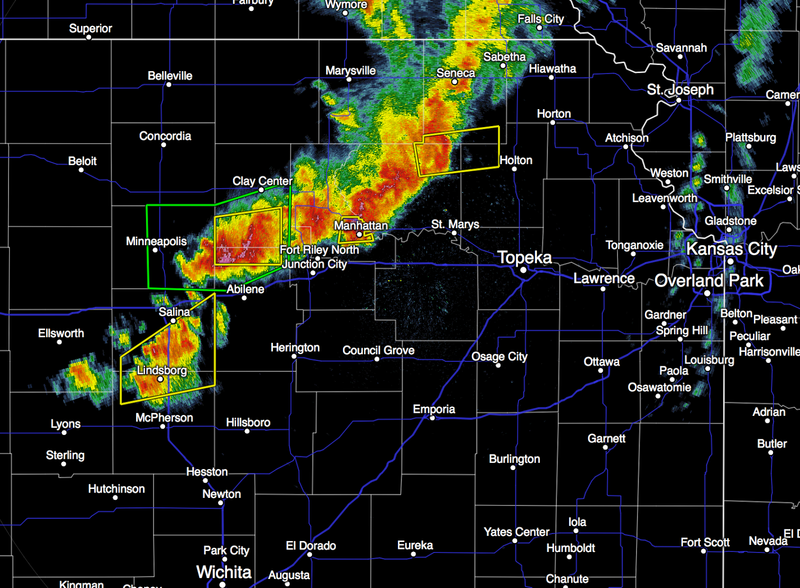 A flash flood warning was just issued for Harper Co., Kansas. The flash flood threat will continue during the evening. Update at 6:59pm. Radar at 6:56pm shows gusts above 70 mph in the circled area. Be aware with the approaching line of storms! Here is the AccuWeather Regional Radar from 6:25pm. 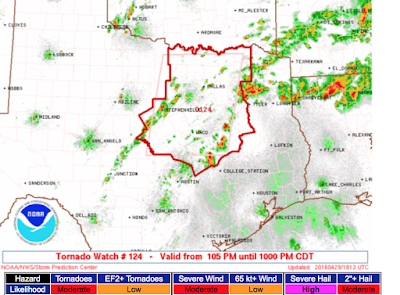 The tornado watches (scroll down) continue in effect. However, I've created this quick look at what I believe are the primary hazards in each region (not the exact location of the letters). FF = flash flood. 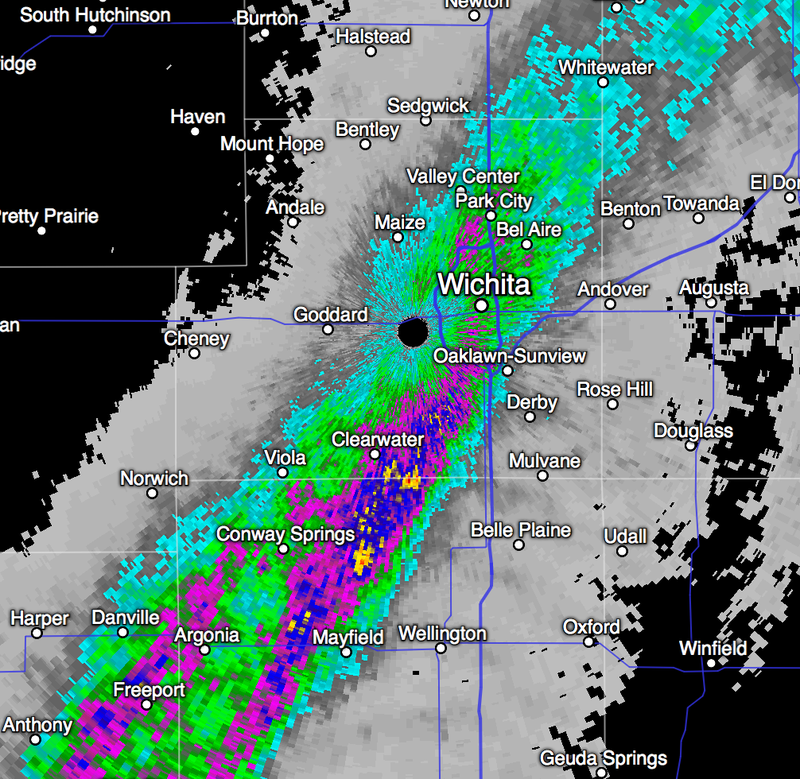 Some spots in Kansas have already had 4" with more on the way. The satellite image from 6:15 has the 6pm dew points (a measure of humidity) plotted. The southeast winds are bringing more and more moisture into the region which could mean more rains that could cause rainfall in the inches as the evening progresses. April 26, 1991, Sumner Co. Kansas., tornado photo by Tim Marshall. 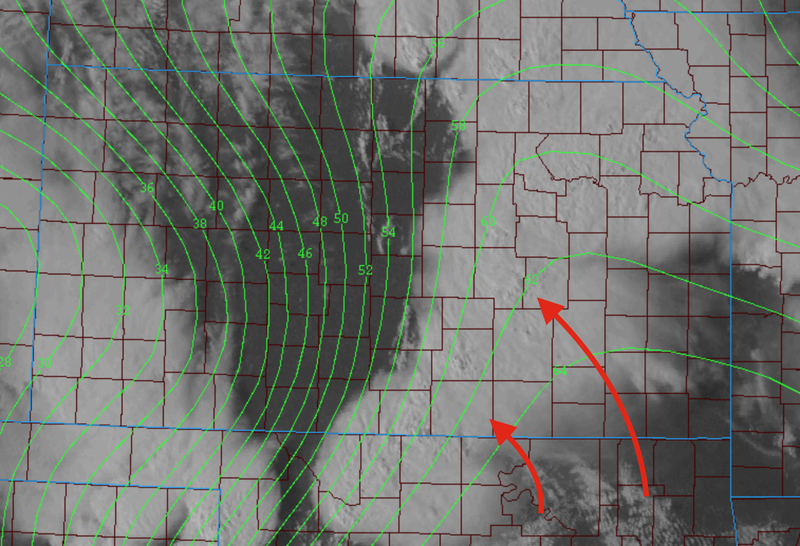 I was tracking tornadoes in similar areas at this time 25 years ago. Here is the radar at 4pm. 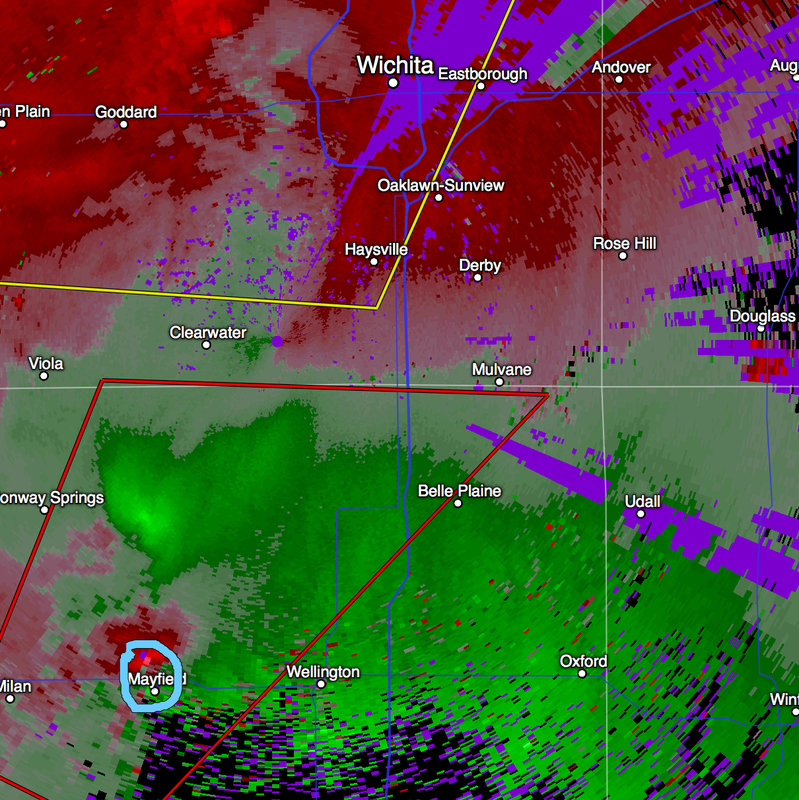 I've circled the rotation that is right over the town of Mayfield, Kansas. Confirmed tornado there. 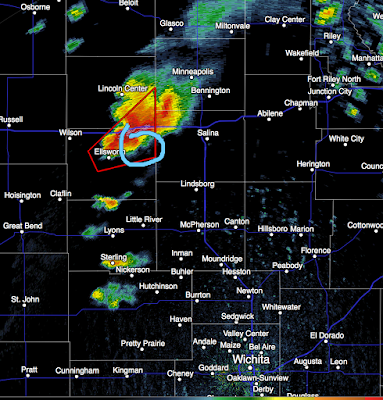 It is moving NNE to NE. 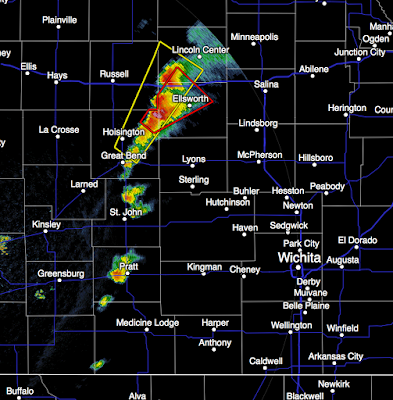 Red polygon is the tornado warning. 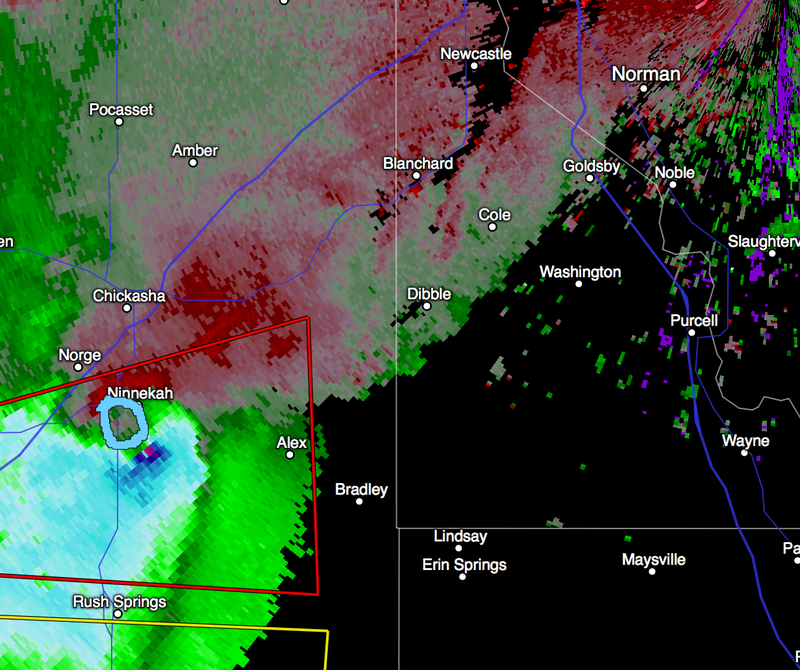 At 4:02, I've circled the rotation on Doppler rotation, a luxury we did not have 25 years ago. 3:17pm radar. Tornado warning in red polygon. 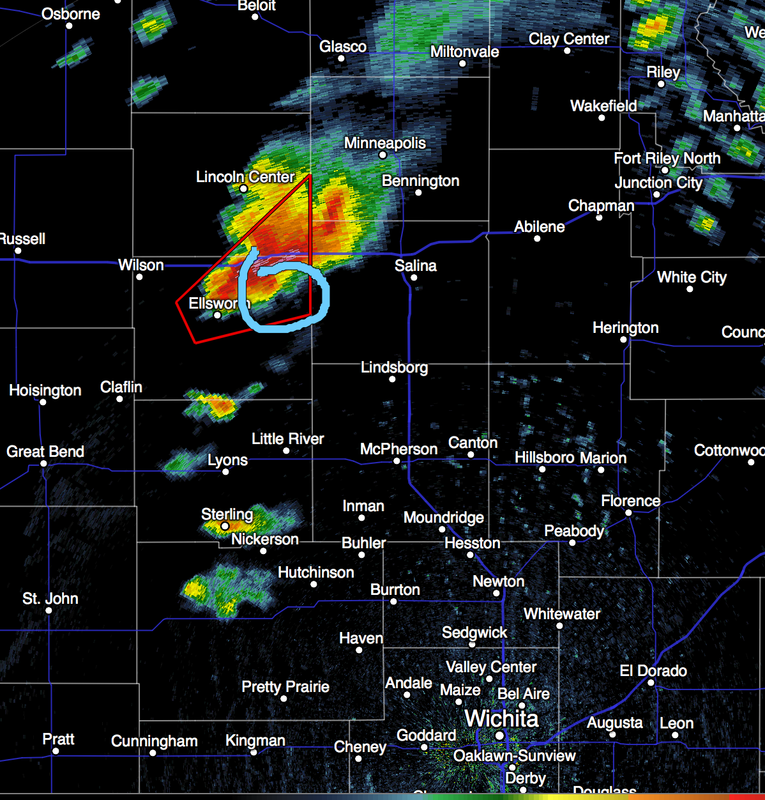 Area of possible tornado circled. 1.5" hail already reported. Storm moving toward Wichita Metro. Follow me at twitter: @usweatherexpert. I no longer "live blog" storms. 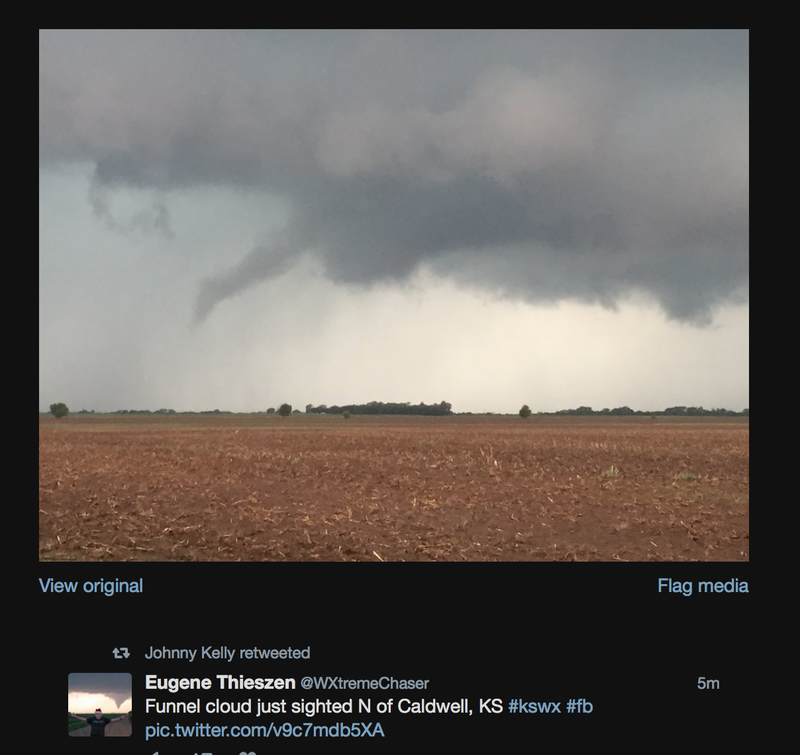 The real-time data is sent via Twitter: @usweatherexpert . These watches are rare. 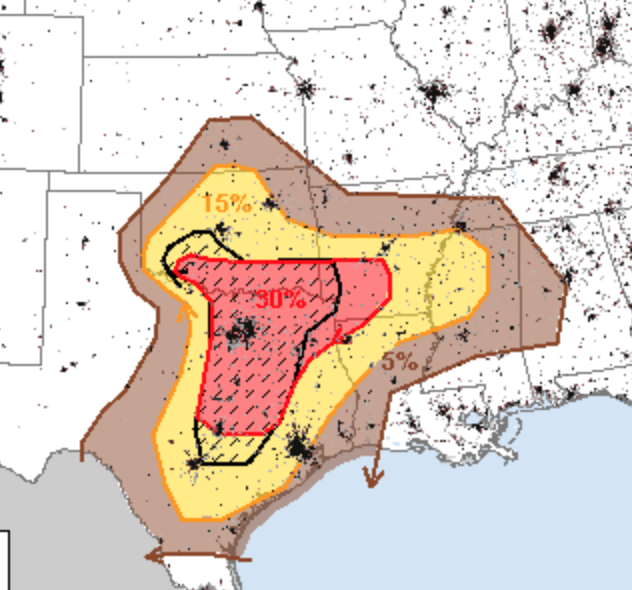 Likelihood of violent tornadoes is "high." Please pay attention to the weather. Radar at 2:35pm shows no serious thunderstorms in the watch area at this time. 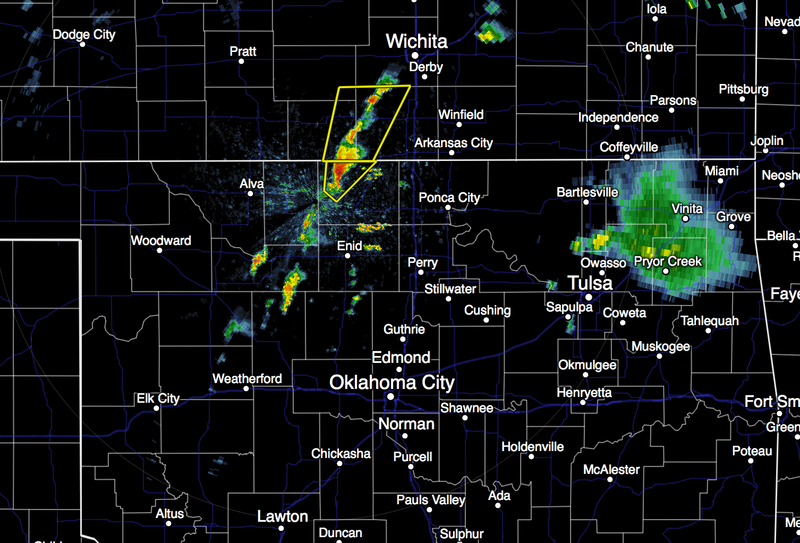 The severe thunderstorm near Wakita will cross into Kansas shortly. Here we go. I expect an Oklahoma watch shortly. 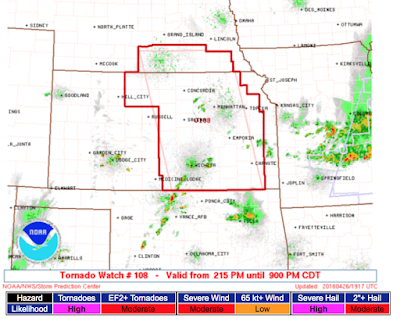 In the meantime, red area is tornado watch for most of eastern half of Kansas and south central and SE Nebraska. Here is the radar at 2:12pm, lightning plotted. 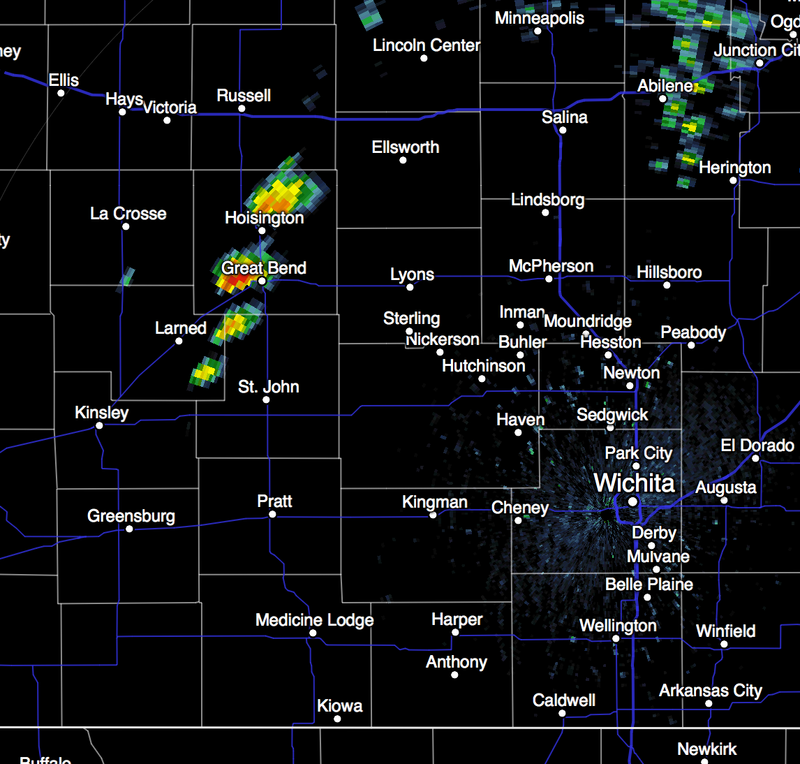 Storms, for now, are moving NNE as they develop. 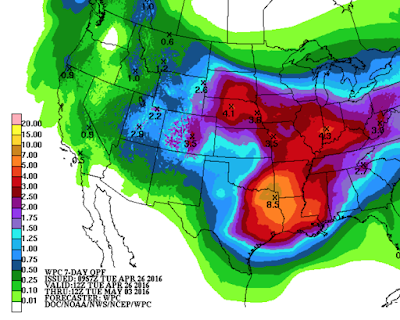 There is a possibility we could see a flooding pattern begin as early as this weekend in the South. Please stay tuned. I should just link to this story every April rather than writing a new one. See here, here, or here, among others. Below is a screen capture from KSNW-TV's (Wichita) version earlier this evening. The Kansas Highway Patrol evidently doesn't like storm chasers. I'm certain officer Crittenden thinks he is doing a service by going on the air to complain about storm chasers. He said that some chasers speed, some shoot video while driving and, according to the narrator, there was an instance where a chaser did not pull over in front of a police vehicle that had its red lights and siren on. I have a suggestion for officer Crittenden: Give them tickets! Stop going on the air and griping about storm chasers! As KSNW's on meteorologist, Leon Smitherman pointed out, they depend on reports from storm chasers to help warn their viewers! Think that is an isolated instance? 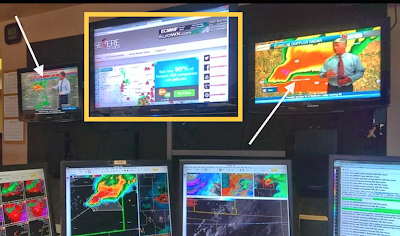 Here is a screen shot from the NWS in Dodge City showing their work station during a tornado situation in its warning area. 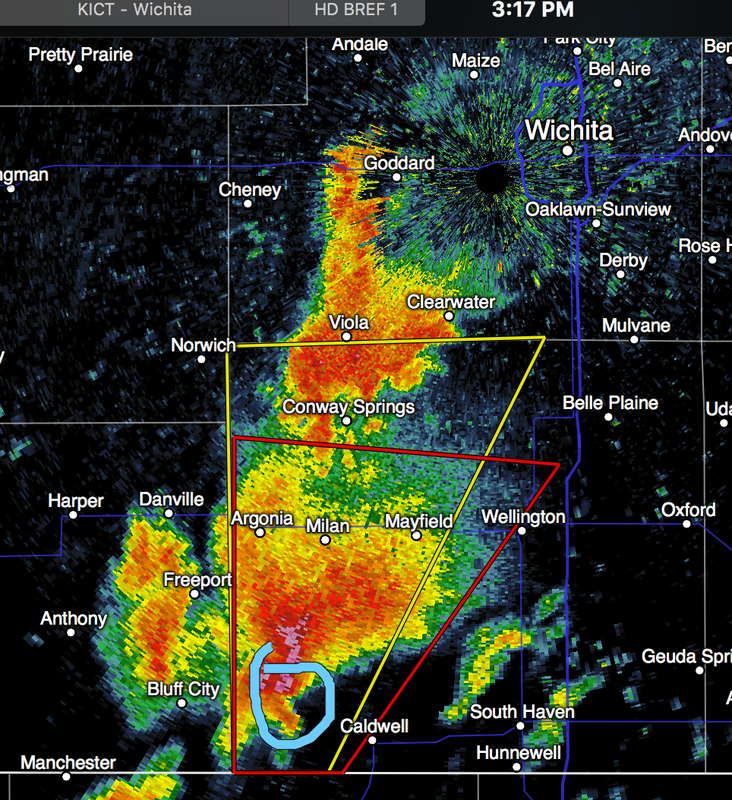 From left: KWCH TV which has its own team of storm chasers. The center screen is severestudios.com which is nothing but chaser reports! At right is KSNW's screen, the same station just airing the complaints about storm chasers. Of course, Dave Freeman and his KSNW team also rely on chaser reports. Storm chasers, for better or worse, are an essential part of the warning process. The police's annual lament about storm chasers has gotten very, very old. When storm chasers break the law, give them tickets. Quit whining. There have been situations in Oklahoma, Texas, and Mississippi in the last three years where police have blocked roads in the wrong place. In the Mississippi case, it is possible the road block may have gotten an innocent motorist killed. Law enforcement plays a difficult and vital role in our society. But, genuine storm chasers know far more about storms than policemen and women. More about that in a second. This was posted on Facebook a few hours ago. 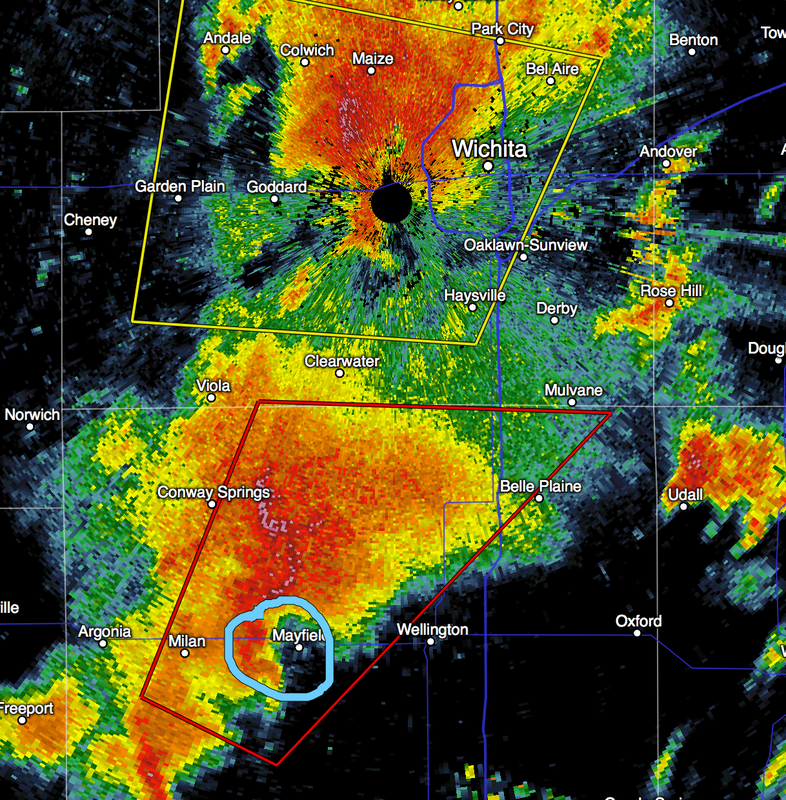 It has been estimated there are 200+ chasers in Wichita tonight. There are likely others in Salina. Meteorologists and storm chasers are known for our dullness*. We don't trash hotel rooms or have crazy parties. I wonder how Denny's and the hotels in town would like the police "chasing" away profitable business? Here is my suggestion: If law enforcement is collectively wise, they would convene a meeting with chasers and ask, "How can we work together?" That would be beneficial to all concerned. I hereby make an offer: If Wichita-area law enforcement will convene the meeting and they need a venue, I'll personally pay for it. Really. But, please, stop the whining!! *Absolutely true story: The City of Reno, the early '80's, gave incentives to the American Meteorological Society to have its annual meeting with its thousands of members. A couple of weeks after the meeting, AMS HQ received a letter asking us not to return! Why? We don't gamble, we don't see the shows and we don't do other hijinks. They lost money on us. Consider that, on a next-day outlook, 15% (yellow) is the significant threshold, it is easy to understand that this forecast is a big deal. There could be a number of violent tornadoes -- that may extend into the nighttime hours -- tomorrow afternoon and night. There could also be giant hail and damaging thunderstorm wind gusts. I'll have updates as needed! 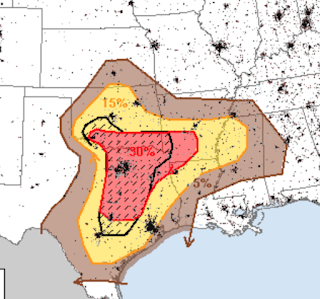 Meteorologists will, again, be incredibly busy tomorrow issuing tornado watches, warnings and other types of products designed to keep Americans safe from approaching storms. Others will be issuing warnings to aircraft designed to keep them away from landing/taking off in dangerous weather and to avoid severe turbulence. Ever wonder how all this happens? The death toll from once-frequent downburst-caused plane crashes has been cut 100% since 2004. The death rate from tornadoes has been cut 97% since the 1930's. These are astonishing, Nobel-worthy accomplishments. 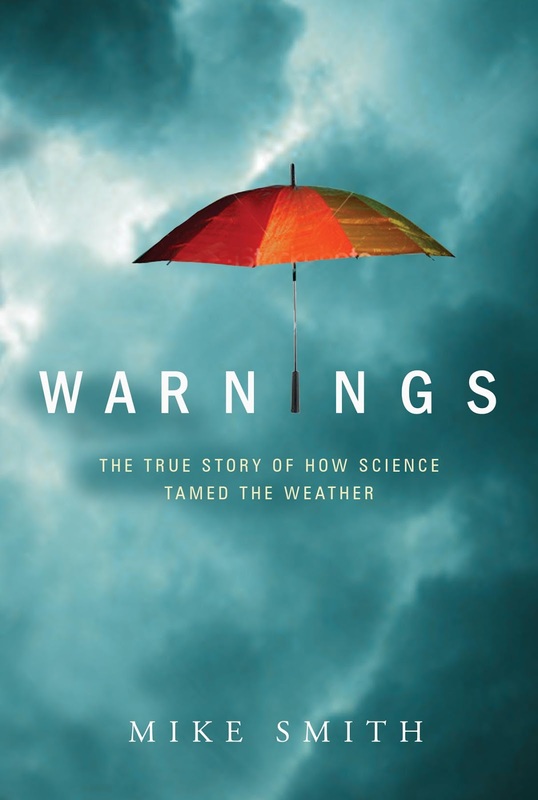 Warnings tells the story of how courageous meteorologists created the extremely effective, low-cost warning system we enjoy today. With storm season in full-force, now is a great time to read it or to give it as a Mother's Day or graduation gift. From Barnes & Noble here. And, if you are coming to the 25th anniversary of the Andover tornado commemoration tomorrow evening, you can purchase a copy for just $10, including sales tax. Autographs are free! If you already have a copy of the book and I'll be glad to sign it for you. 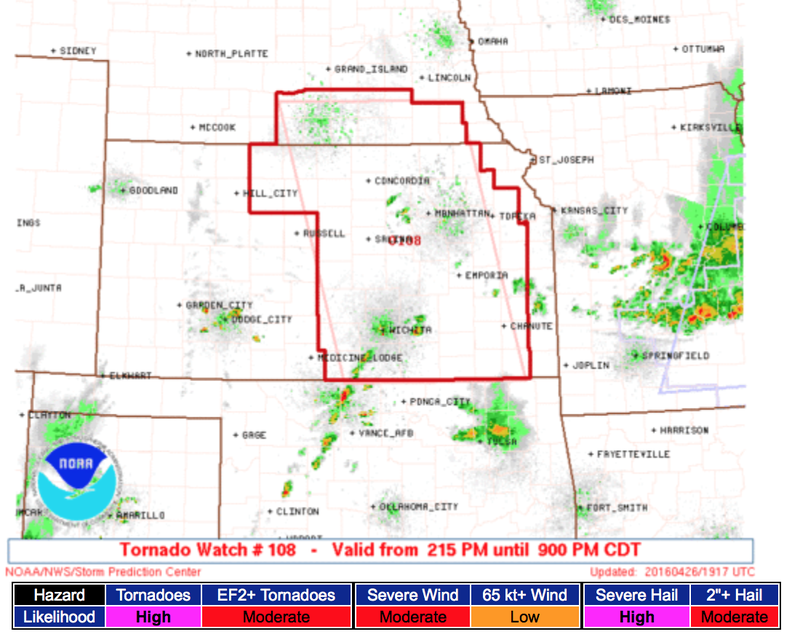 Tornado watch has been cancelled in Oklahoma and for some counties near Dodge City. No tornado warnings in effect at the moment. 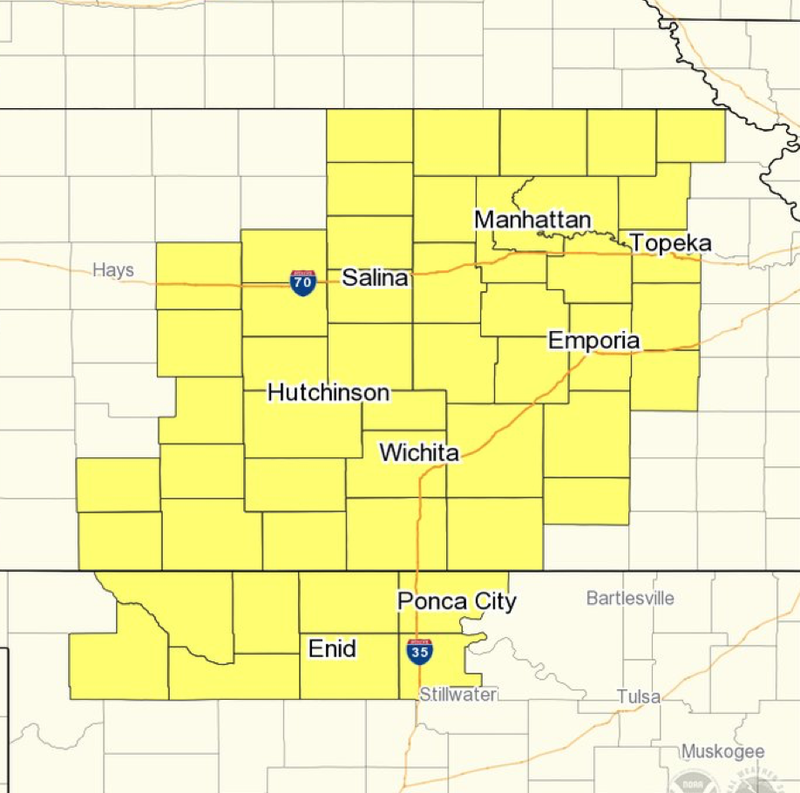 New severe thunderstorm warning just issued on the storms north of Wichita that were mentioned in the previous update (below). There is still a small chance of severe weather developing yet this evening. 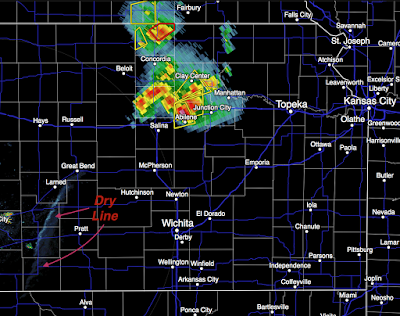 The dry line is holding in position (see satellite image and radar). 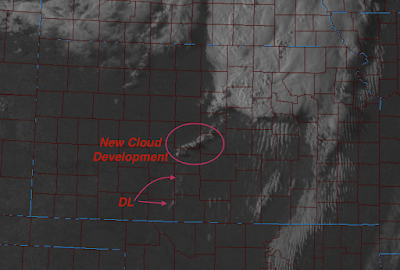 The new clouds in what is now a very unstable airmass means there is still a small chance of redevelopment. 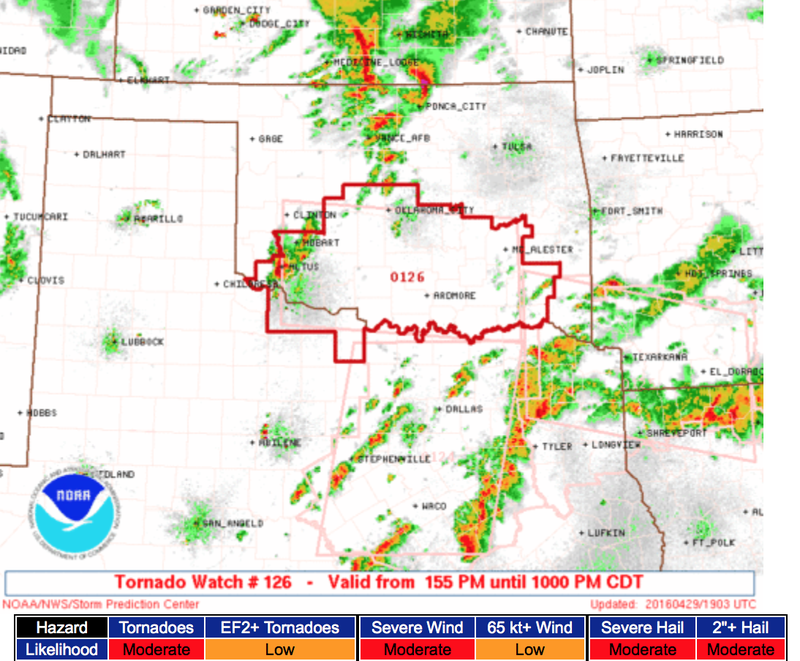 So, the NWS, for now, is continuing the tornado watch and I agree. We've also had reports of golf ball sized hail which will likely grow during the evening. 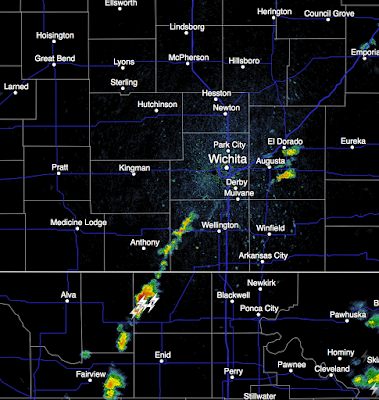 Note that thunderstorms are now developing as far south as the KS-OK border. 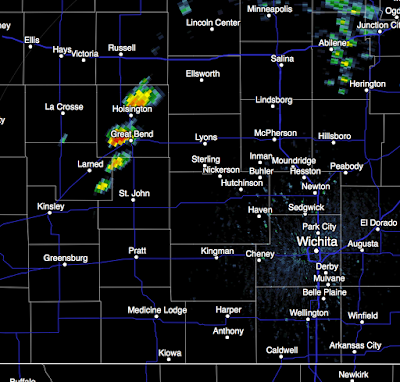 Those storms should begin moving ENE. REPORT OF A TORNADO 4:12pm. 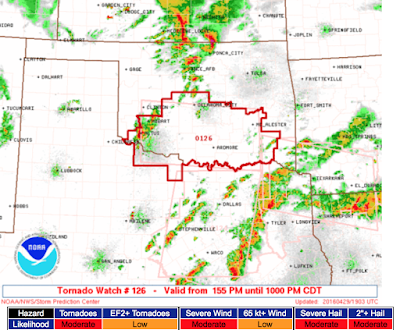 The NWS has issued a tornado watch for much of central and northeast Kansas and a part of north central Oklahoma until 11pm CDT. In addition to a risk of tornadoes, they are forecasting a "high" risk of hail ≥2" in diameter. See below for tornado suggestions. 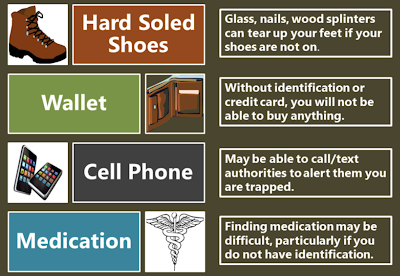 In addition, put the car in the garage to protect it from hail. 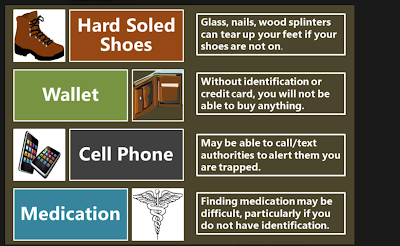 Put trampolines and other items that can blow about indoors. 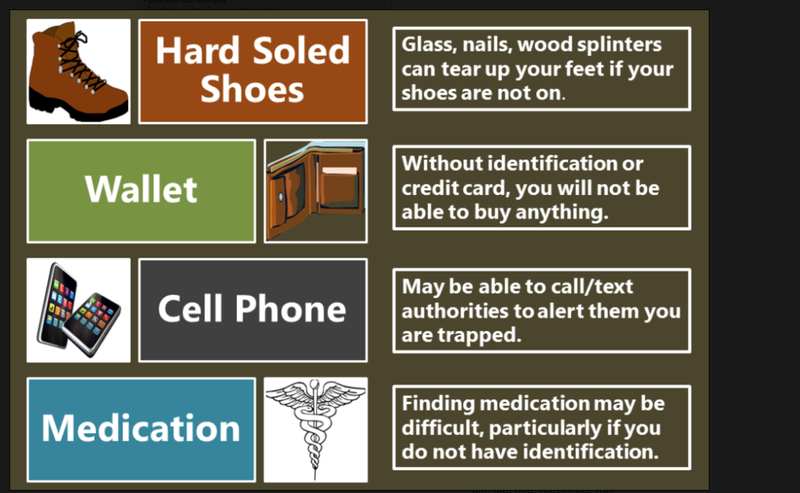 Time to make sure your children and infirm relatives are aware of the watch and have a plan for quickly getting them to shelter. Note: While I no longer live-blog storms, I will update at least another couple of times through this evening. 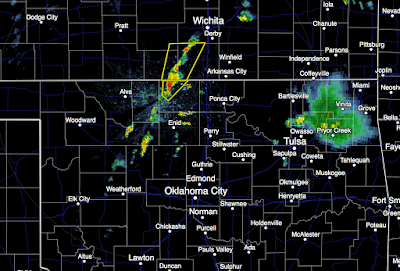 Below is the radar at 3:06pm. The storms in central Kansas are moving ENE.